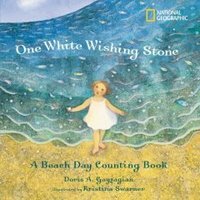 One White Wishing Stone: A Beach Day Counting Book by Doris K. Gayzagian, illustrated by Kristina Swarner. A mother, a daughter, a day at the beach. It begins, "one white wishing stone, smooth and round and cool"; "two periwinkle shells in a tidal pool." After ten, "I make a castle in the sand / with walls and steps and towers / and trim it with the things I've found / and make believe for hours." I also liked how the numbers matched the object depicted (tho I think that the 5/ five fingers of a starfish could be confusing to young children) and that when the castle is made, it does contain the correct number of objects found. I grew up by the beach; so this book set at a beach, with a child doing what I did at the beach, makes me happy. And Queen Lucy and Skaterboy are also little beach bums. What made me fall in love with this book are Kristina Swarner's illustrations. I'd want any one of them framed. The textures are amazing (according to the book, its watercolor and pencil). More artwork by Kristina Swarner is here and here.